The Cat Vet (Elizabeth McKinstry) at 2210 South Street in Philadelphia has a front window that, weather permitting, provides a play & snooze space for kittens looking for a new home and loving human companionship. 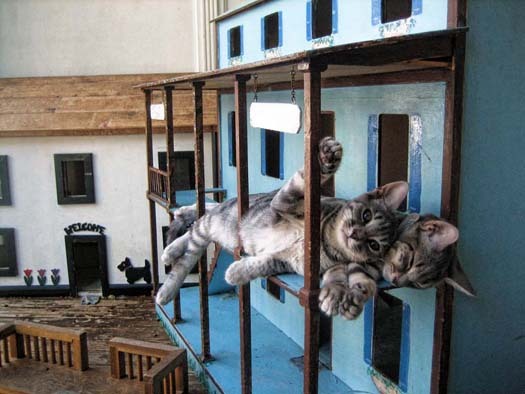 Max, Gabby, and Rennie all won a place in B&B’s hearts with their rolling and tumbling and darting in and out of the large doll (cat) house that occupies about a quarter of the large front window. The two kittens pictured above are not my siblings, but I’m sure they both found good homes. They are awfully cute hanging out on the second floor balcony, though. Don’t you think? that is the coolest pic….. they look like the’re waiting for the Mardi Gras float to pass them by……..